Aaron is a PhD student. This requires him to spend a significant fraction of his time thinking about hard things. To accommodate the necessity of depth in his working life, Aaron developed a ritual he uses to quickly shift his brain into a state of concentration. Aaron puts on headphones and plays non-distracting meditative music (this track is a favorite). He launches FocusWriter, a stripped-down text editor that hides all the features of your computer (not unlike George R. R. Martin’s use of Word Star). Getting through these steps takes around five minutes. As soon as Aaron’s done typing in his final answer he turns immediately to the scheduled deep task. Aaron (not his real name) sent me a note about these habits only recently, but the idea of a depth ritual is one that I’m encountering more frequently as I continue my research into the topic of deep work. I don’t know exactly why such rituals work but it doesn’t surprise me that they do. Achieving unbroken concentration is not like flossing — an action you can just choose to do — it’s instead a mindset: and a non-natural one at that! To slip into a state of depth, we need all the help we can get. Which brings me to my own habits. I don’t currently deploy a depth ritual, but I’m increasingly convinced that such a commitment would benefit me greatly. Indeed, with this in mind, I experimentally deployed Aaron’s specific set of steps before I wrote the blog post you’re currently reading. It’s now exactly 29 minutes since I turned on my computer, and I’m now about to hit publish on this piece which I wrote, formatted (including imaging processing), and edited from scratch all during this single session. For me, these results are, for lack of a better word, deeply impressive. This approach to work is interesting. I can certainly see ways to apply it to my work in writing and reading. Can you see ways to apply this concept in the “cubicle farm” environment common in large companies? What is the difference between habits and DEEP habits? What is the difference between a ritual and a DEPTH ritual? What is the difference between being impressed and deeply impressed? When someone think about HARD things… what this exactly means? A rock? Metaphors and hyperbole are not included in my field of expertise, so I need clarification on these things, please. “Deep work” is the act of focusing without distraction on a cognitively demanding task. This term, which I created ex nihilo, is the foundation for all my other uses of deep. For example, deep habits means habits that help support deep work. Deep rituals are rituals that help support deep work. Etc. If you seem intrigued by the depth offered by the ritual, I’d strongly recommend that you investigate simple vipassana meditation. Currently I’m exploring a visualization technique in my daily sittings that is geared towards enhancing focus and encouraging flow states. Meditation can appear to be a bit woo-woo, but I initially looked into it to improve concentration for the LSAT. I too am a fan of meditiation before I want to work on something that requires focus and effort. I find doing 10 minutes of a guided meditation (I used a couple of apps that focus on mindfulness), helps me quiet my mind. Then, I will make a clear list of what I want to finish in my session (about another 5 minutes), and then go. It’s been helpful most of the time I try it. The main times it isn’t successful is when I’m doing work that I have no interest in completing, it is simply a task I am “required” to do for my job. I at least find it easier to complete with fewer distractions at those times, so while I’m not “perfect”, that 15 minute ritual really does help me. Headspace and Calm are great guided mediatation apps that offer free trials! And I am sure you’ll find what you need on YouTube too. Pingback: Do you have a study ritual? Aaron: If you follow this blog you are probably interested in every single piece of the process. The example shows fitting results to a suitable target journal which is perhaps common but still an afterthought. Papers in Nature and Science did not get sent there as afterthoughts. Prolific Nature/Science authors are experts at asking the right kind of questions, answering the questions with elegant methods and frame the results in an appealing way. We only see their successes in Nature/Science, their “failure results” that are not as catchy go to other (high-impact) journals. Reverse your process: select a preliminary target journal before you start working on the research question and use that as guide for what kind of results you need and the methods used for getting the results. The research will never lead to the expected results; revise the candidate target journal if the results turn out to be interesting but not appropriate for the journal you had in mind. The link to FocusWriter indicates in the text that the program doesn’t have a spellcheck. The proper program page explicitly states so. Well , sir I wanted to know what exactly were those seven questions “Aaron” used for his ritual ? I was curious. I would be really interested in seeing the full template Aaron uses, if that is possible. I was just thinking about rituals on my drive into work this morning as I was drinking my coffee. I realized how I needed to stop drinking coffee because I was losing my taste for it and if I needed a caffeine boost in the morning I could get it from healthier drinks, such as green tea. But every morning I am compelled to put the kettle on, grind the coffee, set up my cup and drip cone and paper filter and make that cup of coffee–it is a ritual and it automatically triggers not only actions, but feelings and mind set as well. If I don’t do it, I feel off for the rest of the day. And that also made me think of professional athletes and how they have pre-game “superstitions” that I believe are not superstitions at all, but RITUALS that trigger them into the actions, feelings and mindset of high performance. I think you would agree Cal, that high performance could be another name for DEEP WORK. So I need to look at my rituals more closely and find ones that will launch me into the state of high performance deep work. I just finished reading SO GOOD, and I’ve been devouring this blog for the past few weeks. I only wish I had paid more attention to it when I was still an undergrad! I definitely fell into the deep procrastination zone during my last 2-3 semesters and didn’t get the most out of my education. I’ve been working at my current job as a hospital administrator for 5 months, and prior to that was an intern for 9-10 months. I recently started trying to delineate my work into small tasks, mild- to mid-difficulty projects, and deep work/learning. This is harder than I thought, but for my deep work/learning, I switch off my overhead light and turn on a small desk lamp, close my door and put on some headphones. This makes alleviates some of the trepidation of doing more unpleasant mental work (learning VBA, thinking through difficult processes), and has helped make these “deep” sessions more productive and serves as a visual reminder to stay focused. Music doesn’t help much and I usually turn it down low, but it is almost more of a reward for getting into a mentally difficult zone. I’m starting to set goals ahead of time for a session as well. This works well in an office job, but I’m also fortunate to have an office with a door! I’m working at applying the lessons from this blog to a job that isn’t quite the same as a faculty/research position, and I’m still doing a lot of troubleshooting. Would you be interested in getting a sort of “case study” in a few months? I don’t have time to blog at this point, especially since I start grad school in January, but if it’s something of interest to you or your blog readers I’d be happy to write that up and analyze several months’ worth of efforts. Also, you’ve had a few posts on flow/deep work. Flow is great but I don’t learn anything. I learned how to do data analysis to the level that I get assigned cool projects from my higher-ups, but I’m also not learning hard new things from it. The work is meaningful and satisfying, so I’m not complaining, but I wanted to add another vote to the “flow doesn’t equal deep work” side of the argument. Terrific blog, by the way. Genuinely work-changing, and by extension life-changing. Nice idea. I created with some questions one could consider before starting each task (based on the Steve Pavlina blog post). Feel free to use mine or create your own (if you want to modify it or keep records of your answers). I hope it’s helpful! Thanks for sharing. I found your template very useful. I especially like the third question. It is not the question about passion, but it is interesting how it suggests that having the mere “instrumentalization” of something for your career as motivation might be counterproductive. For me, 15 minutes is the magic number for a depth ritual: if I am going to practice piano or sing, I do a 15-minute Hanon or vocal warm-up. If I dance, I do a 15-minute stretch. If I am going to work on acting or getting ready for a performance, I sit in a chair and do relaxation exercises. Same if I find that I am not getting my writing or admin-type stuff done. I find it isn’t merely about warming up the body, it’s warming up the mind and letting go of distractions, and thinking about what I want to do for the next 15, 30, 60 minutes or more. I don’t know if that can be applied to the work y’all do, but having the habit of a physical warm-up seems to get me on-track and focused, regardless of what I am about to do. I find writing down the exact steps I’m going to do on a piece of paper and then moving to a different location does wonders in terms of transitioning to deep work. If I’m still a bit stuck, a few minutes outside does the trick. I’d love to see more examples of templates that people use to get focused in on deep work. I do have trouble, even when I try and summarize the important finding of a piece of reading I’m doing, keeping that idea in mind when I’m reading the rest of the article. Then I get bogged down on smaller details. He accesses this template using the program textexpander. Basically you type in a short string of letters like .mtx and the template pops up in the text file. I’d need something a bit different to keep my brain on task during reading, but I do like the idea of having a textexpander template to bring it up quickly. I have been following Cal’s blog and a few related blogs on the deep work/productivity and apply what I read and sew which one works for me ( it produces results ). So far, what works is writing down a to-do list before embarking on the work and making the items in the list as clear as possible on what to do, so that when going through the list, you know what needs to be done. Doing this step before starting the work helps to clarify a lot things that actually needs to be done. Hi Cal! I’d like to second the request – could you share Aaron’s 7 questions? Most excellent performers have a ritual. Twyla Tharp talks about this. (Google her book.) Stephen King On Writing. 99U’s book Manage your day to day is useful in this regard. Mason Curry’s Daily Rituals also addresses this topic. The main takeaway seems to be: having a ritual enables you to start deep work in a state of autopilot, removing the mental hand-wringing that comes from the uncertainty of difficult mental work. Slightly off topic but I would like to know what Cal’s thoughts are about using music and binaural beats to initiate a particular mental state. From what I have read some people say it works and others say the binaural beats are nothing but a placebo effect. Also the track that you link to in the post is a meditation track, wouldn’t this be the opposite of the focused state that Aaron needs to get into to do deep work? Thanks for an amazing blog, just like everyone else here, I think your writing and subject matter is excellent. Interesting read. I’ve never used a depth ritual like this before but I’ll definitely try it out in the future. Thank you so much for this post, Cal. I have been applying this to my writing work, and I have found it very useful in both warming me up for my session and combating procrastination. I’m looking forward to your new book about deep work! I googled the phrase “mental rituals in preparation for academic work” and this article was one of the two search results that did not have anything to do with OCD. Today I took the GRE. 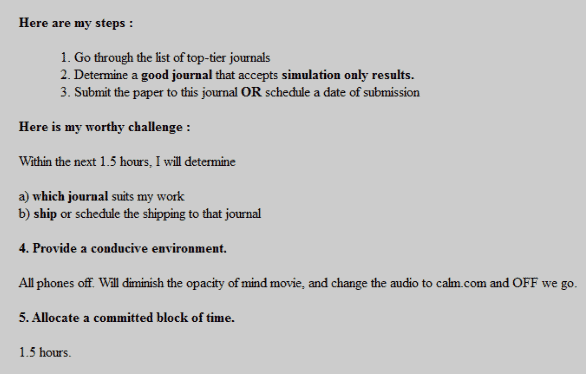 I needed a good verbal score and to be able to write the 30 minute essays at the beginning which are are for me to do. So I tried every mental trick I ever heard of to get myself into a mental space. As a college student I knew more than one person who would count their steps and say their multiplication tables on their way to calculus class to get themselves geared up for math. I have read about at least mathematician who repeatedly counts to one hundred as he walks. My biggest challenge is putting words to ideas as a write so I decided to list food items alphabetically to from a to z. I missed my exit on the way to the testing center but when I finally go there and sat down to take the test, I had no problem writing the essay. Even when I struggled to find a word, it came to me quickly. Time felt very slow. This made me wonder are there rituals that people use to get themselves ready for academic work? Has research been done on this?